Sometimes "out of my head" is a bad thing. But sometimes, I get some things "out of my head" and onto paper or (more likely) the computer and it can work out well. Back in February (was it that long ago?) I made some blocks that I "messed up" -it was an accident...but maybe my brain and the muse were playing a game with me. I decided to show the blocks, then I named them. One of the blocks is a "Crescent Wrench" block. I call it the BeltBuckle Quilt. To me, each red stripe looks like a belt with sliding buckles (the yellow/gold parts) on it. Well there you have it- out of my head and onto your screen. Edit: Thanks to Tonya, I also see guitars. So if you see Guitars, you can call this one "Guitar Town"
Quilt as you go and Quilt along. Just so you know I didn't run away or fall of the edge of the earth, I am posting what I am working on. I am in the process of making a queen size quilt as you go quilt. 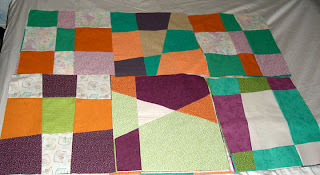 Here are the three blocks I hope to get quilted tonight. The fabric is part of a FQ collection from Connecting Threads called sweet and sour. Oranges, purples, aquas, greens and neutrals - how fun is that? I am also doing the Moose on the Porch Jelly Roll Quilt Along --what a name! Here is my latest block. 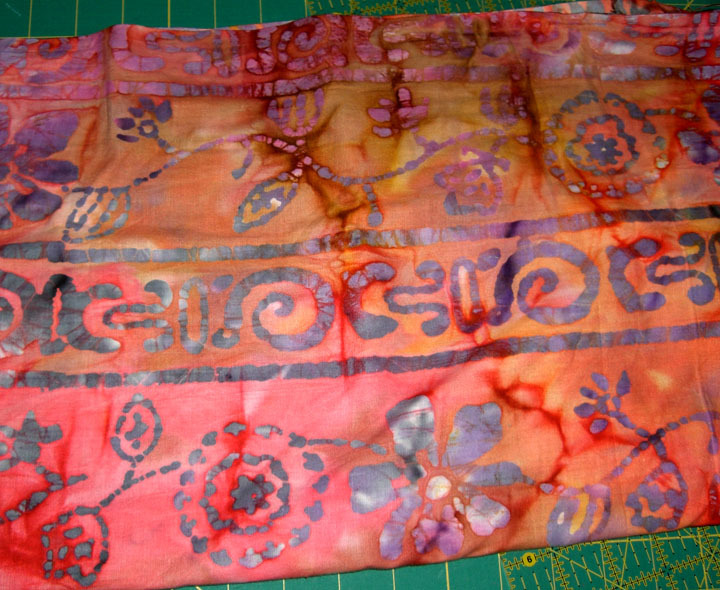 I am using a Simple Abundance jelly roll with muslin as my background fabric. I won a package of MistyFuse in the the IHAN (I Have a Notion) 32 days of giveaways. I decided to try a fused appliqué. And just for grins I used my self portrait stamp, printed it out and used it as my pattern. I confess I am a bit "wompy eyed" in it. But hey, this is a first time, okay? Okay then! After I cut and fused the outline onto the cream fabric, I put some multi color polyester embroidery thread in the machine, dropped the feed dogs and set the stitch to zig zag. I free motioned the outlines and some embellishments. Thanks to Kelly at IHAN and to the Attached Corporation for giving the prize. I might do some more wild fused appliqué one day. Oh and thanks to Ricky Tims for the hand dyed fabric that made me so colorful! PS.. this looks prettier in person. For some reason the photo looks kinda blah. My friend Pat was challenged to do this. She tagged me. So here is the 6th photo that was ever posted in my blog. This is a painting that I did in 2006. I have since sold this painting. I do however have a high quality file to use for prints. This painting was made using what I call the "play with your paints" method. I did not start out intending to make a landscape at all. However the "smooshed" paint lent itself beautifully to making this scene. Sometimes an angel guides your hand. After the smooshed paint dried, and I saw the magic, all I did was embellish it. I took the "Flies in the Butter" block and made a slight adjustment to it, then laid out a quilt from it. I am calling this the ShooFly quilt. Wish I had time to make it. (((NOTE: I edited this to include the link to the block, it is my design. I suppose I should be ashamed....But I am not. Hey, even dogs like me! You see I won again-this time over at Tango's Treasures. She said that Harley (the dog) picked me as the winner. Now here is the prize package, I got it today. There is one item missing, a niece has a nice little pad of sticky notes that look like cute shoes. (yep, I am a decent uncle!) ( you can see it on Tango's blog HERE. Check out the perfect for paper piecing ruler and mini cutting mat. Then a NICE selection of Guntermann threads. mmmmmmm sewing goodnesss, And finally a charm pack of sultry by moda. Sometimes I wonder what an old goat like me did/does to be so lucky. Whatever, it is I want to keep it up. I love prizes in the mail! Freebird Fabric at Quilt Taffy. Doncha know that has me singing some Skynryd? (yeah, that was on the "Pronounced" album. Geez, I can't sneak anything past you people can I? In the last post I mentioned, oh so casually that I did some serger projects. WHAM Tango commented with Musta missed the post on you getting a serger? and Barb commented did I miss a post where you got a serger? If so, how do you like it? So the post I didn't make a few weeks ago must be made. I decided to get a serger. I looked at them for a long time. I couldn't see a real reason to get one. Then I saw a show where a lady made several items in a flash with her serger. "I need one of those!" I thought. A few weeks went by, I shopped eBay and the internet. I saw sergers for thousands of dollars. I read horror stories of impossible to thread machines. I read praises of the serger. I got my income tax refund and made a decision. Amazon had the best price on an inexpensive serger that got mostly good review on the internet. So this little puppy came to my house all shiny and new. It came with four spools of thread...each a different color. Why on earth? Wait a minute..look at the dials. Yellow, Red, Green, Blue - just like the threads. it makes figuring out the threading a bit easier. See under the dials? I added labels with the name of where each path goes and the threading order. I believe in making things easy. 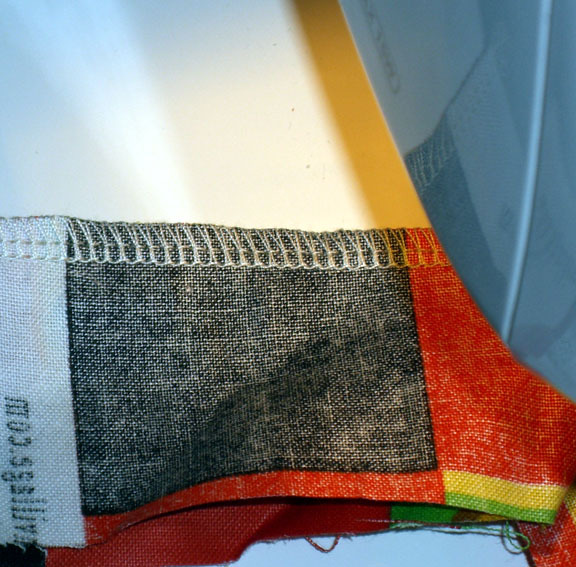 The serger finishes edges nicely. It trims the edges as it goes for a very clean finish, plus the edge is covered so you don't get ravels. This is a rolled edge. Think of a washcloth or a napkin or a nice scarf...yeah, that kind of edge. I did a picture where I did it with a metallic thread, but I couldn't get a good picture for you. Trust me it is coool! You can use decorative threads in the loopers and get some interesting finished edges. Wow. My plan was to put the binding on my quilt Monday and Tuesday (and maybe Wednesday) nights. I sewed it all together Thursday of last week and pressed it. However, I couldn't wait. After a nice weekend where I relaxed, and did some small projects, I just had a fun Sunday night watching television (recorded sewing shows) and sewing on binding. First, here are the small projects I did. I used my serger to make some eyeglass cases and a little neck purse. You can see I like the blue and red fabrics - I used them twice. Next up, the finished quilt on my bed. We are expecting some cool nights so I will get to use it! Yaay! I am thinking that the bed skirt will have to go. I need a solid tan or cream skirt so it doesn't fight visually with my quilts. I suppose I could make one, but I would rather quilt or make some more cute projects. Mail's in - Back from the Longarm Woman! I was so excited today. I got this big box in the mail. I knew it was coming but I still had a hard time containing myself. You see, I have never had anyone quilt for me. Plus, I designed the pattern for this quilt by myself. At the time I didn't even know what a "rail fence" pattern was. After sitting in a bag for over a year (the top was finished in January 2009) I had it quilted. I am so very pleased with the work. 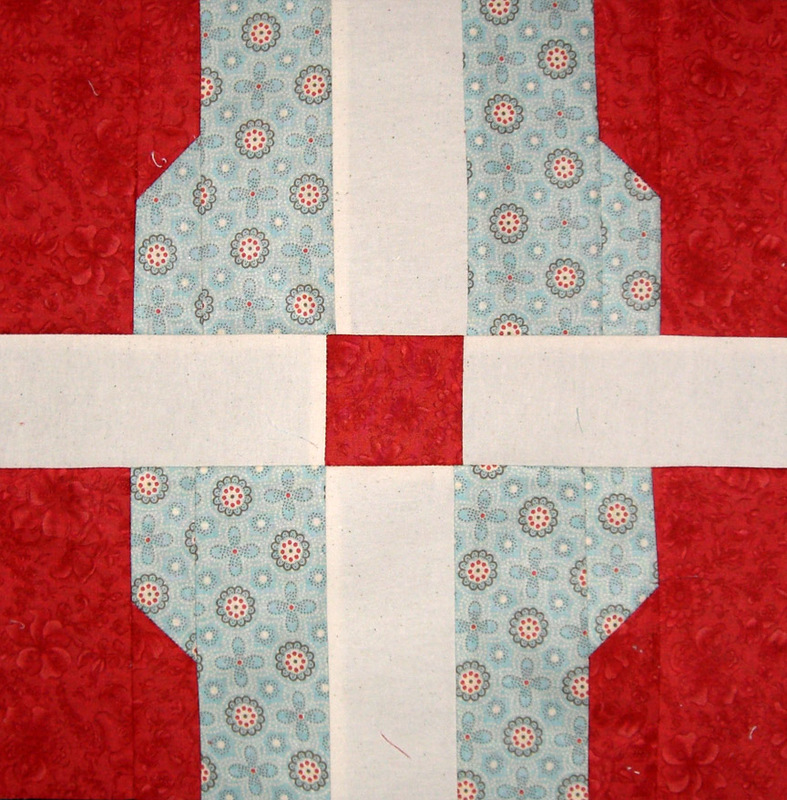 Joanne at Insanely Cheap Quilting Blog is the quilter I used. Her prices are excellent! For simple meandering solid color thread, she will quilt a queen size quilt....yes I said QUEEN SIZE... for $65. I also let her supply the batting (it was as cheap or cheaper than I could buy) so I didn't have to ship that. The batting she used is Warm and Natural -my favorite! Joanne does not do "show quilting" She quilts for people who need those tops that they made with love quilted so they can be used. Personally I am not making show quilts. 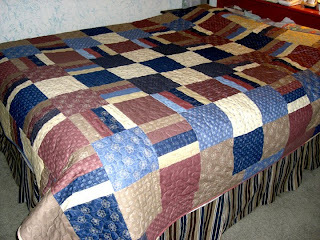 But I do love making quilts to be put on the bed and keep a body warm. Now, I can't easily quilt a full or queen sized quilt on my home machine. So Joanne is the perfect solution for someone like me. 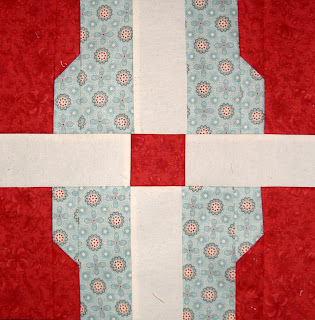 I am adding a picture of the quilting detail on a couple of blocks. 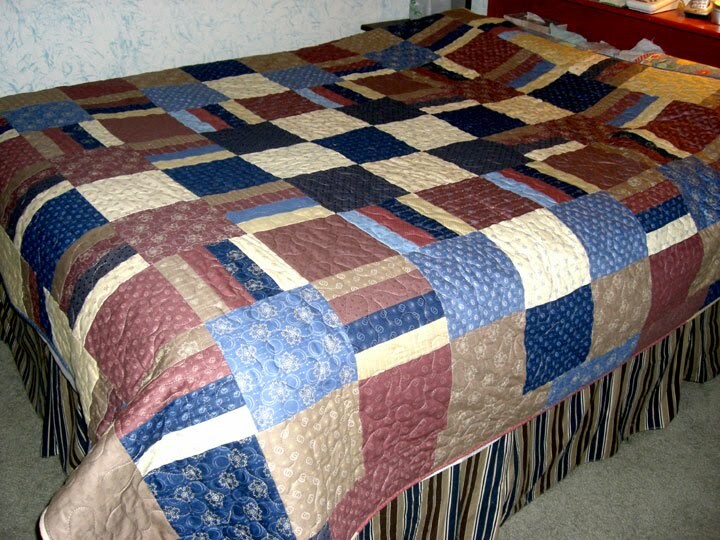 To me this is the perfect amount of quilting on a big quilt. Don't forget- go to Insanely Cheap Quilting and get those beauties out of the closet and onto your beds! So what have I been making? Well folks, I was commissioned to make a couple of Queen sized quilts. The first one is well underway. 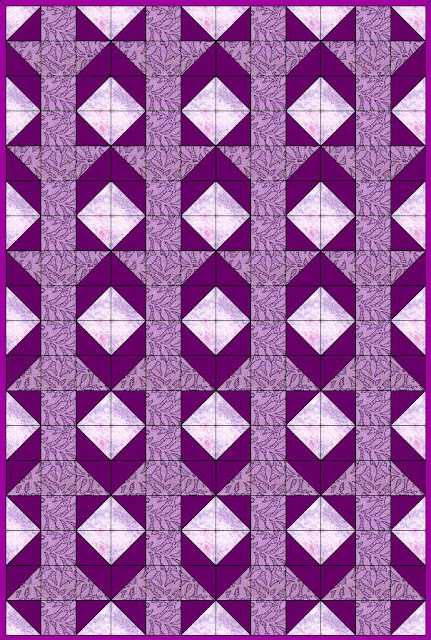 I am making big -- no I mean BIG blocks for this quilt. They are slightly smaller than a fat quarter. 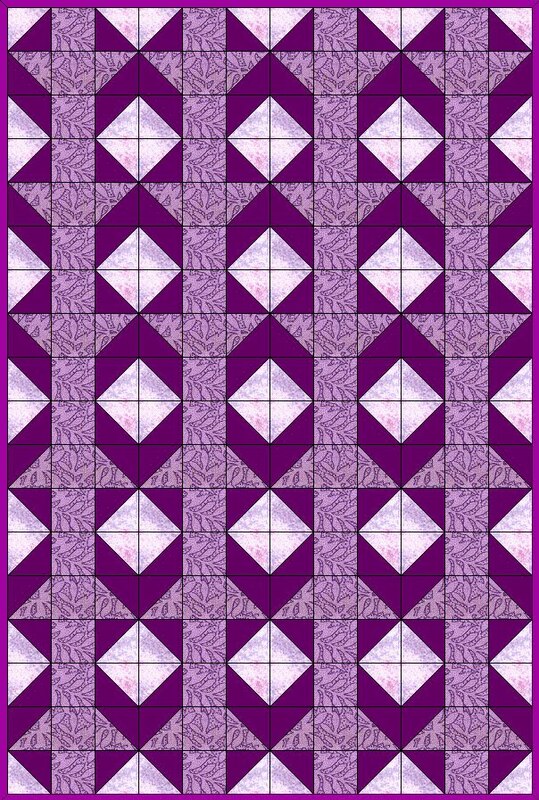 I have enough blocks made to make the quilt. I will do this in a quilt as you go manner. Here is a sampling of the blocks. The fabric is "Sweet and Sour" from Connecting Threads. One of the fabrics (the darker looking orange) I used the back side to get a greater contrast. I am thinking this quilt will be a really wild crazy quilt. 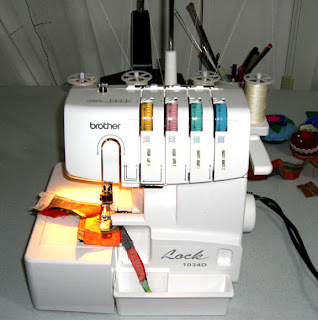 I will be using the decorative stitches on my machine to do the quilting --AND I will be using bright colored threads to make it really pop. Okay, the Giveaway, Yeah I know you probably didn't read the part about my quilt, you were so excited about a giveaway. A few days ago, I posted this giveaway. The response has NOT been what I wanted. I want a LOT of entries. So I have decided to add two half yards of fabric to the prize package. This batik......I just love the pattern AND the rich warm colors with the design in cool tones. This is a half yard. Yeah, I know you want this! It is the "Love those Fat Quarters" fabric that I had left from my quilt. 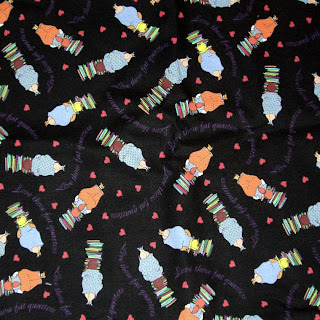 (also it was much coveted in an earlier giveaway - I found MORE so I have this to give) This is a half yard also. All entries must be made at the original post. To be entered Following Nick's blog is required. I would love to see Nick get 50 followers. Right now the end date is "soft" meaning....we haven't decided yet. The picture to the left here is the other prize....Oh yes, and I am putting in some of my Art Notecards.. They have my art prints on the front. There are some examples of my cards on THIS POST. Okay, so I hope the Moose on the Porch Quilt Police are on vacation. I guess I was too tired for this. WHAT?!?!?! It isn't wide enough. So I pulled out the PDF file and looked it over. Oh @#$#@ There are six stripes not five.! What to do? seam rip it all out? Not hardly! Toss it and start again..no thanks, I am afraid I would run out of Jelly Roll before the quilt along was over. I know: FAKE IT! LOL. I have a new word now. This block is not just unique. Oh no! 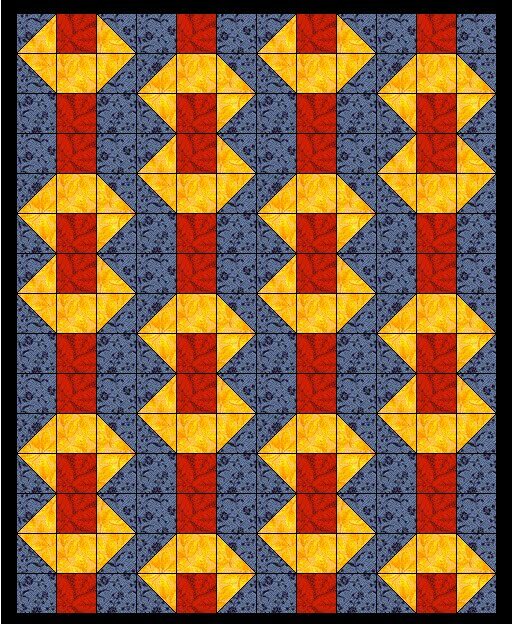 It is "extraunique" I figure that even people using the same Jelly Roll will have very different blocks. But they will have blocks that are the same. -right? Not me...I did a number on this one. The Strip at the left side is the add on strip. I said, hmmm... looked at the leftover pieces and made it fit. You can see the design is "off" a bit. Okay, another confession. When I first cut the pretty red strips I cut them 2.5 square NOT the 2.5 by 3.5 specified. I found that BEFORE I sewed. So I put those aside. Well, ya see, I decided to just use one of them for the add on strip. So here is my quirky block. No, not quirky -- it is extraunique. Okay, so I did a tease in the last post. Barb said I was "mean" to post it as just a teaser. Oh well, that is me, heart of stone! Ha ha - NOT! My friend, Tom the carver, has a blog that Nick, one of his creations is using to post a journey. The blog is Whittler's Hollow. For this entire year, Nick is telling of his journey from the Swamps of Louisiana to the his completion as a work of art. 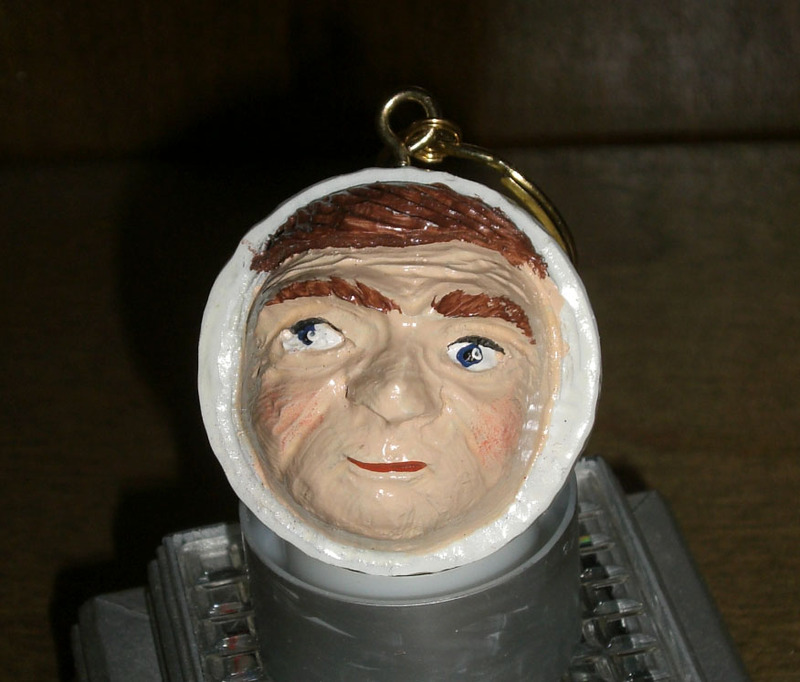 Nick will become a Santa or Father Christmas figure from Whittler's Hollow (the website - not the blog). Tom also carves other creatures. One of his creations is a GolfBall Critter. If you golf, or know a golfer, then you have experienced or heard how sometimes even with a perfect swing, the golf ball goes far astray. ( Yeah, it happens to me when I play miniature golf, I haven't graduated to play with the big boys.) Well folks, the secret is that inside those seemingly innocent golf balls lurks a GolfBall Critter. That little man in there decides he didn't like the way you addressed (hit) the ball (which is his home) so he does a sneaky little spin and carries the ball far from where you wanted it to go. Tom carves away the outside of the ball so you can SEE the little man inside. I took two pictures so you could get a side view. The stand is not included because that is a stand from one of my pretties. I just used it to support Mr GolfBall Critter. Can't you see the mischief in his eyes and in the look on his face? I confess that this is a cast version of an original. Originals are kinda pricey for a giveaway. I am not feeling that generous!. 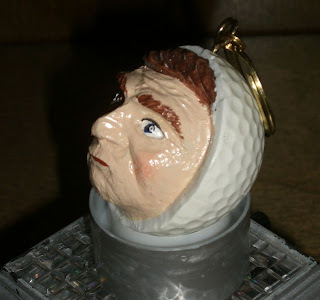 To be entered to win the GolfBall Critter you need to comment here AND go to Whittler's Hollow blog make a comment there and become a follower. Some of you are already followers. Great news for you- all you have to do is comment here - and if you have never commented on Whittler's Hollow blog make one comment over there. Are you cool with that? I know there will be some type of fabric added to this. I THINK that Tom has a bag for the Critter. This bag is handmade by his FATHER who was 93 when he made the bags. I hope Tom finds the bag to add to this as no more are being made and it is a collector's item. And maybe I will add some notecards printed with my art. Well what are you waiting for ? Get to it. Hey I love you, my dear readers! I hope your TODAY is happy! EDIT: You MUST be a follower of Whittler's Hollow blog to be entered. Thanks! A giveaway! One prize is already chosen, there will be a prize package. Keep your eyes on this blog. Think of Christmas and a journey and knees. Mmmm...maybe if you read back in my blog you can find a clue. Is there a golfer in your life? Maybe you? Maybe someone else? Or maybe just someone (like YOU) who loves unusual items with a fun story attached? Ha, enough talk. If you want to guess in the comments what this could relate to: Go for it. It could possibly earn you an extra entry! how is that for motivation! Gotta run, my timer went bbeeeeeeeppppp! I won! I won! My "not winning" streak is over!!!! I know that some of you think I win all the time. Actually it has been a while since I won anything. The fact is, if I don't want the prize I don't enter. A few friends have prompted me to enter their giveaways- probably thinking I missed it. Fact is, I am trying to no collect "stuff" that I don't need. That said, I am a quilter. I always NEED fabric. Right? RIGHT!!!! 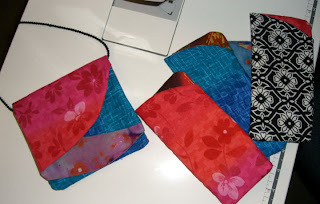 So when I saw a giveaway at Quilt Taffy for a "pick your prize" giveaway, I entered. Joy joy, bliss bliss! I got an email today from Corrie. I won!!!! yippee. 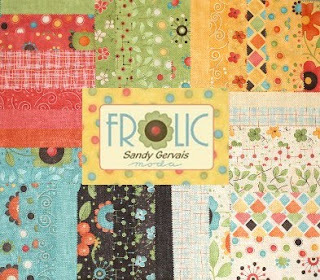 Now I have been longing for this fabric, frolic by sandy gervais, for a bit now. I am not sure what I will do with it. But here is what I am sure of: I will love it. It appears to have a good mix of lights, darks and mediums. The nice thing about a charm pack is that you can lay out various arrangements and see how the mix works. And it doesn't cost much. Then if you love it you can get the layer cake or the FQ bundle or the Jelly Roll with assurance that you like how the fabrics play together. I can't wait to PLAY with this Charm Pack from Quilt Taffy. I know they have an eBay store. So if you are jealous, go shop at Quilt Taffy on eBay. I'll get you my pretty! and your little dog too! That's right! it is from the Wizard of Oz. do you want to win some Wizard of Oz fabric? How does five yards sound? Chris over at We love Quilting is having her April giveaway. So rush right over and enter. Tell her, the wicked err.......Gene Sent you. Edited to add: I can promise that the US Postal Service will NOT let Chris mail you one of her neighbor's dogs, so feel free to enter! Hear the bells ringing they're singing that we have been born again. HE is Risen, Alleluia! All creation rejoices. Ring a bell, sing a song. JUBILATION on this day! The tomb is empty! When you upload an image through Blogger, it gets stored on Picasa Web Albums, and is therefore subject to the quota limit on your account there. You can log in there with your Google Account to access all your images. Now I can log into the Picasa web album and see all my uploaded blog pics there in ONE plae - and re-use them if I need to. Hooray. And a big Thanks to all you who commented with ideas for re-using pictures. Not sure this will work but here is a link to my album! I got busy on a project that has been sitting for a while. My signature quilt from Linda's birthday swap has been pieced and patiently waiting for me to get back to it. So I decided I needed to work on finishing it. I had this fabric that I won in a blog giveaway. 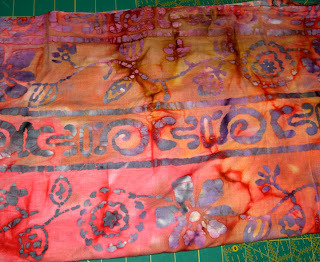 And this fabric that I gave away part of on my blog. Both of those are quilter oriented so they really work well for making something for ME! And since the signature/friendship quilt is one I will cherish for a long time AND has the work of a LOT of quilters in it, I chose to use it now! I decided to do a pieced back - which is a lot like making another quilt top. I did big blocks and sashing to preserve the motifs on the light background fabric. And here it is layered and basted -tossed over a recliner. Now all I have to do is quilt and bind and my large lap quilt will be finished! Wanna see the front again? Go to this post I haven't figured out how to re-use a blogger photo, if you know how and can steer me in the right direction I would love to know. Off to see the Longarm woman! It has been sitting in a bag wondering if I had forgotten it. Today it headed out on a trip to see someone who will tender work on it until it becomes a real Quilt! I sent it to one of my followers who also does long arm quilting for NON-show quilts. After all, I am going to put this on the bed and use it so that is what I want! 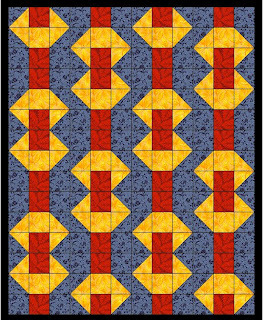 If you are wondering, I made up the pattern for this quilt. It is really pretty easy to do, but I wanted to use the FQs and Jelly Roll of fabric so it was all matchy matchy. I downloaded the fabric swatch images and put it in EQ. Here is how it looked on my computer screen. Okay, so I didn't use exactly all the fabrics, but I did stick with the COLORS so it is really close. Ha, I can't even follow my own pattern exactly! Yep, I am waiting to see what Joanne does with this. I am thinking an overall meander --maybe I could do it myself, but I really REALLY didn't want to wrestle this queen sized quilt thru my domestic machine!